The Hail Mary Prayer is the primary Western prayer to feminine divinity. The words to the Hail Mary have been carefully crafted by the patriarchal Church to exclude the divinity of the Divine Mother. A very simple re-writing of the Hail Mary prayer, however, restores it to the fundamental pre-classical Western tradition of the worship of Our Mother God which was the first and universal religion of all humanity. Here we briefly discuss the changes made in the words to the Hail Mary that restore it to the Universal Tradition of Our Mother God. The version used here is the definitive version of the Filianic Hail Mary Prayer used in The Gospel of Our Mother God. And blessed is Thy most beloved Daughter. Let us proceed to examine each of the revisions and see how they fit into the thealogy of Our Mother God. 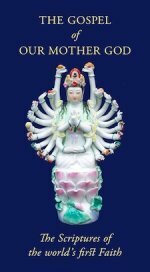 "Hail Mary, full of grace" could indeed be used of Our Mother God, Mari/Marah being among the fundamental names of the original feminine Deity. However, the phrase is dangerously ambiguous. "Hail Mary, Fount of grace" makes it clear that Our Mother God is the Source, not the recipient of Grace. She is full of Grace in a sense that no created being can be because She is the Source and Fount of all Grace. In this definitive version, as used in The Gospel of Our Mother God the assonance with the Christian version has been abandoned in favor of a simple and universal statement of Déanic faith. The Christian version implies, and is intended to imply, that Mary was a "woman" who became blessed by the masculine god. There is a certain ambiguity and "blessed art thou among women" could mean that women give blessing to Dea. However, this revision removes the ambiguity. 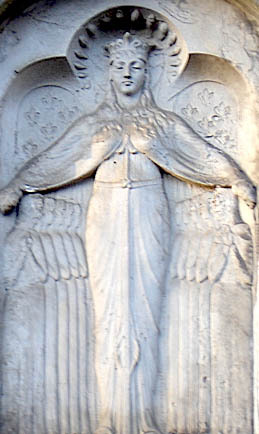 "Blessed art Thou by all women" could also be used; however, the version published in The Gospel of Our Mother God is intended for use by all devotees including Chelouranyi, who avoid the term "women". The reference to Jesus was actually inserted into the Hail Mary prayer after it had been in use for some centuries. The purpose of this was precisely to try to inhibit the worship of Mary as Our Mother God. It is possible to leave out this line entirely, which is only taking the Hail Mary prayer back to an earlier form, but since many devotees of Our Mother God are Filianist Trinitarians this adaptation is the one most commonly used. Another important aspect of this emendation is the removal of the "womb" reference. The birth of God the Daughter is not a human incarnation but coming of the Universal Savior. It is not a material human birth but a transcendent Divine birth. A simple and obvious emendation. The formula "Mother of God" in Christian usage has always been heavy with ambiguity. It clearly implies a Being antecedent to, and the Source of, the masculine deity. Christians are then left with the task of denying what they have so strongly implied. "Mother of Jesus" would not imply this, but words have a power of their own, and the much more ambiguous phrase "Mother of God" has always been used. I believe that Dea is One, and there is none beside Her. Thus in the Déanic versions of the Hail Mary prayer, "Mother and God" places the matter beyond all doubt and ambiguity. Since Mary is God, to whom would She pray? The Daughter prays to the Mother in The Gospel of Our Mother God, but Mary is the Name of the Mother Herself. We come to Her not for prayers to some other god, but for shelter beneath Her mantle. There is also a subtler thealogical issue here: the implication of "praying for" sinners could be that of interceding for them with an angry masculinized "god". The Déanic version of the Hail Mary prayer makes it clearer that we are calling on the all-powerful and all-loving Mother to shelter us from the "ungentle winds of werde" – the sorrows and dangers of the samsara. The last line is identical in each version. 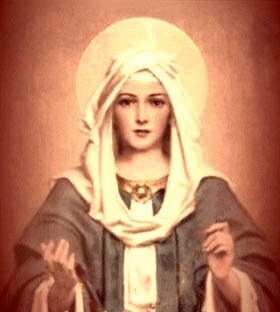 Whichever version of the Hail Mary prayer you choose, we wish you all joy and blessings in Our Most Beloved Lady. Why not read your Bible: The Gospel of Our Mother God?